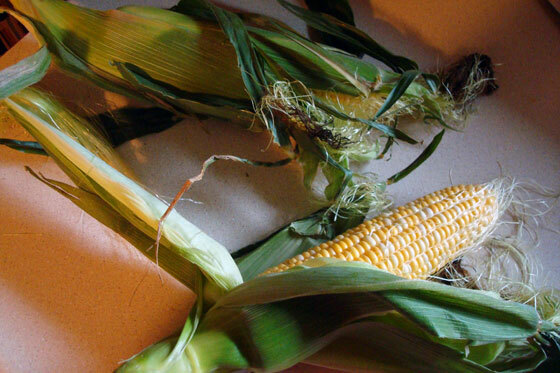 Fresh-picked corn symbolizes summer for me. Sure you can get any food any time of year now, but corn on the cob is something that I eat only in the summer time. 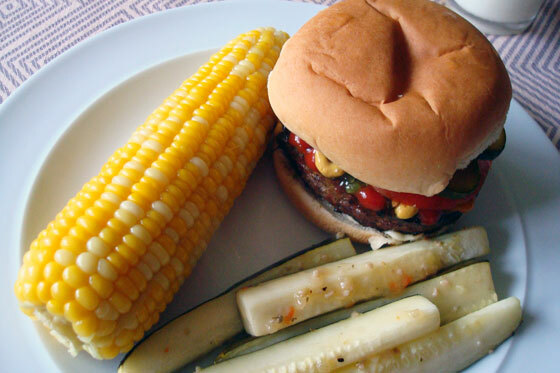 Pair it with zucchini from the garden and burgers from the barbecue, and you have summer on a plate. Although my eyes are perhaps bigger than my stomach in this case. I ate my vegetables, but Matt and Baxter had to help with the burger. What food do you wait for every summer? Anyone else a fan of corn on the cob? What’s on your barbecue these days? Any special meals on the menu the weekend ahead? Wishing everyone a wonderful summer weekend. I am so lucky that my boyfriend is a farmer! He loaded the planter with sweetcorn when he was done with the field corn. I am going to have sweetcorn coming out of my ears! (ha!) We froze 7 quarts this week and he said he only walked ten feet into the patch to get that much! As much as I love sweetcorn, my favorite by far is tomatoes! I am so patiently waiting for the first ones to turn red. I probably won’t wait much longer since I love fried green tomatoes too! Mind sharing how you prepared your cucumbers? They look great! That’s awesome that you have access to all the corn you want. I’m waiting on my tomatoes too… my first year growing my own! For the zucchini, I sliced them into fingers (take out the seeds if your zuc is a bit on the larger side). I put them either in a foil pie plate (if you’re doing them on the BBQ) or on a cookie sheet (if you’re doing them in the oven) and douse them with Italian salad dressing. About 20 minutes on the BBQ (usually around medium) or in the oven (400º) and they’re tender and tasty. I also love really sweet and tender corn on the cob, mmm! I love it when the first nugget potatoes show up in the store, and I love going to u-pick farms. What do you usually pick at the u-pick farms? Whatever is in season when I’m there. I’ve picked peas, beans, strawberries, raspberries and dug potatoes. Not only is it a great experience and fantastic food, but the price is usually pretty amazing!